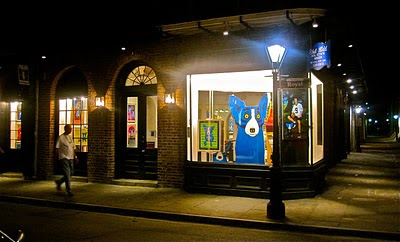 Nearly one year ago George Rodrigue moved his New Orleans gallery from its rented location of twenty years at the corner of Royal Street and Orleans Street to a permanent location at the corner of Royal Street and Pere Antoine Alley, adjacent to St. Louis Cathedral. Although outward appearances suggest a simple move across the street, the change holds resounding significance for an artist who longed for a gallery of his own and who remains deeply connected to an historical city. The week we signed the purchase papers, the Monseigneur himself called to ‘welcome us to the neighborhood,’ despite a relocation of no more than twenty feet. The new Rodrigue Gallery takes up an enormous space on the bottom floor of a four-story historic French Quarter building. For now, we rent out all but two apartments on the upper floors, destined in our dreams to be the Rodrigue Museum. A small second floor space overlooks Pere Antoine Alley, named for a popular pastor from 1774 until his death in 1829. Together with his friend, Voodoo Priestess Marie Laveau, they focused their efforts on assisting New Orleans’ large slave population, especially women and children. Across Pere Antoine Alley, our second-floor vantage grants an excellent view of St. Anthony’s Garden, the green space directly behind St. Louis Cathedral. 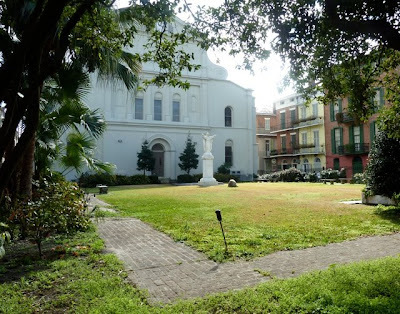 The space dates back to the early 1700s as not only a garden, but also a place for gatherings, markets, meals, rental property, and even a temporary church. Pere Antoine used the space as a kitchen garden, feeding the church’s monks. Furthermore, the excavations turned up interesting finds of clothing, accessories, coins, and other items from late eighteenth and early nineteenth century New Orleans, when Orleans Street and its raised sidewalks* continued past Royal Street, ending at the church’s back door. With a significant purchase of property in this, a unique and historical American city, comes responsibility. 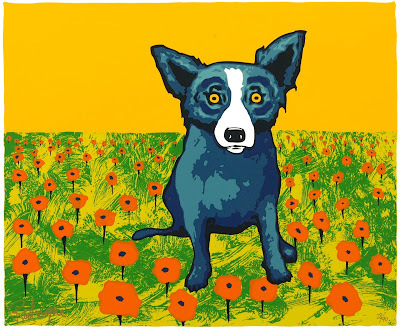 George Rodrigue recognized this from the start and spent nearly a year shoring up walls, replacing dangerous and outdated electrical wiring, and above all else, focusing on general clean-up. With the gallery open and the building near-completed (although admittedly an indefinite work-in-progress), we now focus our attention on the green space known as St. Anthony’s Garden, named for Anthony of Lisbon and Padua (1195-1231*), ‘finder of lost things’ and ‘protector of childless women,’ and located behind St. Louis Cathedral. We feel responsible for this space not only because of our building’s proximity, but also because it sits at the heart of New Orleans, a city we adore and call home. 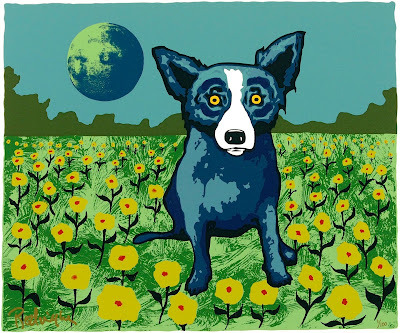 In addition, it is the backdrop for dozens of artists who hang their work on the iron fence, continuing a New Orleans tradition keenly important to George Rodrigue. 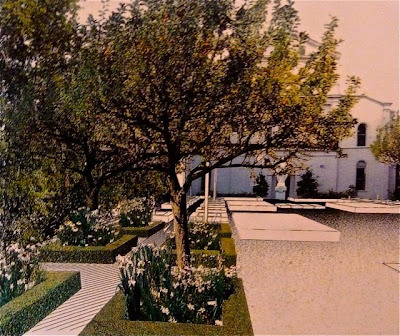 Together with a committee headed by New Orleans resident Sarah Dunbar, we aim to restore this green space to plans sensitive to the garden’s diverse history, as laid out by French landscape architect Louis Benech (drawings below), who lead the restoration of the Tuilleries Gardens in Paris during the 1990s. Benech’s plan uses native plants as well as “centuries of botanical exchanges between Louisiana and its settlers, among whom are the French, Spanish, English, German, Native Americans, West Indians, Africans, Irish and Italians,” ultimately celebrating the different ages of this unique site. Furthermore, the garden’s restoration looks long-term, towards up-keep, security, and docents, so that the space becomes beautiful not only as viewed through the iron fence, but also up close and personal, open to the public. 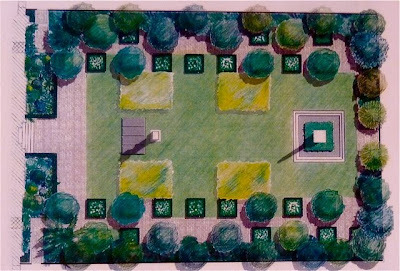 With Mr. Benech’s completed plans in hand, our timing involves significant fund-raising this year, culminating in ‘La Fete du Jardin’ with Monsieur Benech in April 2012, when we cut the ribbon and begin the garden’s transformation. I’ll keep you updated with our progress throughout the year, including the launch of our website this spring, which I’ll post under “More Art and News” to the right of this essay. This is wonderful news Wendy! I have a few photos of the statue of Christ set in the garden; I had wondered often how the area had fared and also remember the many cats that were fed by the fence opposite your building. It is good for someone to finally get some of the real history out about Pere Antoine and Marie Laveau, a team that worked charity in many ways in hard times. I am so happy about the proposed restoration of the garden....I tell you, I am almost in tears!